Soul Song is on a mission to get people singing - even if just for a few moments! We have therefore devised a range of opportunities to get singing out to those who think they don't want to be in a choir. Through corporate teambuilding workshops, festival mass sings, short term pop-up choirs, lunch time choirs and choirs in the workplace all things are possible! 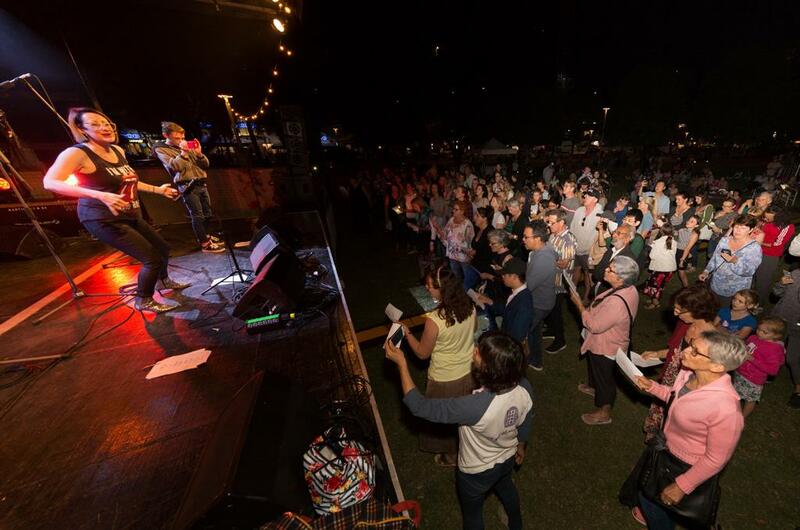 If you have a workplace, festival or event that could be transformed by some passionate singing on a one-off or regular basis, get in touch with Jaq to see what's possible: jacqueline@soulsongchoirs.com.au or 0412 255587. The act of singing releases endorphins, the brain’s ‘feel good’ chemicals, so that immediately the singer feels uplifted and more positive. Studies have also found that singing creates concentrations of immunoglobin A – proteins in the immune system which function as antibodies as well as hydrocortisone, an anti-stress hormone. Group singing is even more powerful however as this increases levels of oxytocin that contributes to feelings of trust for the people around you. It is a bit like a neurochemical soul glue: it allows you to bond more quickly and more deeply with those around you. This chemical presence might explain why in the case of both songbirds and humans, the level of neural stimulation is at its highest when singing in a group. Individuals who come together as a group to sing are proven to bond quickly and to create a community. There is an immediate support system and members feel a part of the group. Our singing workshops designed for corporate groups and community groups, take this science and demonstrate it in action. They are the perfect feel good team building experience that leaves your group not only more unified but also energised and buzzing. The learning and performance of simple harmony based songs, singing in rounds and breathing exercises are great ways of relaxing, having fun and working on elements of team work and cooperation. Singing is a great illustration of how it is important to listen to those around you as well as follow direction. The workshops can be done as part of either plenary or breakout sessions. There are a number of different ways in which the sessions can be run and they can be completely customised to suit your needs, even building in custom song writing, flash mob performances or specific themes relating to your situation.